Posted on October 16, 2018 by Menachem Wecker	in Arts and tagged Arts Program, News, Staff. Floyd Coleman’s dad kept quiet about his son’s whereabouts when two Ku Klux Klan members showed up at his Alabama home in 1960. Coleman, then an Alabama State University student, and his roommate were inspired by the Greensboro, North Carolina, sit-ins and decided to organize their own Jim Crow protests at the university. After the Klansmen left, Coleman’s father phoned him at school. That was one of several powerful and deeply personal stories that the 79-year-old artist shared at the Oct. 7 opening reception and talk for the University of Maryland University College (UMUC) exhibition, “Rhythmic Impulses: The Art of Floyd Coleman and Hayward Oubré,” which runs through Jan. 20. Coleman, whose brother was killed in action during the war in Korea, told the audience that the protests he helped start grew in just a few days from a couple dozen students—to 1,500 participants. Civil Rights activism is one of several commonalities that informs the Coleman works on display and those of his late mentor and Alabama State University art professor Hayward Oubré (1916-2006). Coleman was joined on stage at the artist talk by Eric Key, director of the UMUC Arts Program, and by Oubré’s son-in-law and heir, Mervin Anthony Green. How the three came together, a story in itself, offers a rough sketch of how exhibits are born. Key had known Coleman’s work for some time but had only seen a few pieces here and there in exhibitions. He described Coleman as a longtime supporter of the UMUC Arts Program. 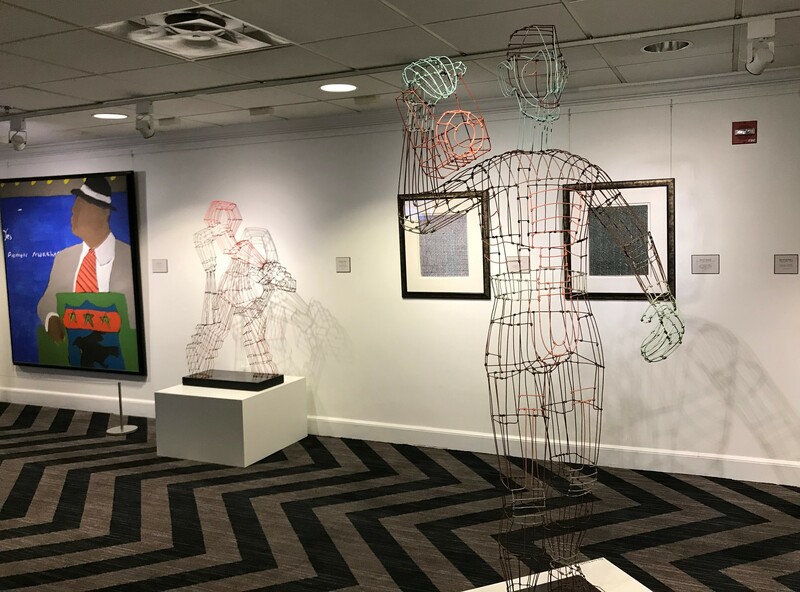 “Everything I’ve called and asked him to do, he’s right there,” Key said, noting Coleman had authored an essay for a previous UMUC exhibition catalog. About three years ago, Key said, he was sitting at home flipping through artist and historian Samella Lewis’s book, “African American Art and Artists,” and he saw Coleman’s work addressed in it. He mentioned Coleman during a subsequent meeting of the UMUC exhibition committee, and the decision was made to pair his work with Oubré’s. Coleman agreed with the plan and helped connect Key with Green, who also approved of the proposed joint exhibition. 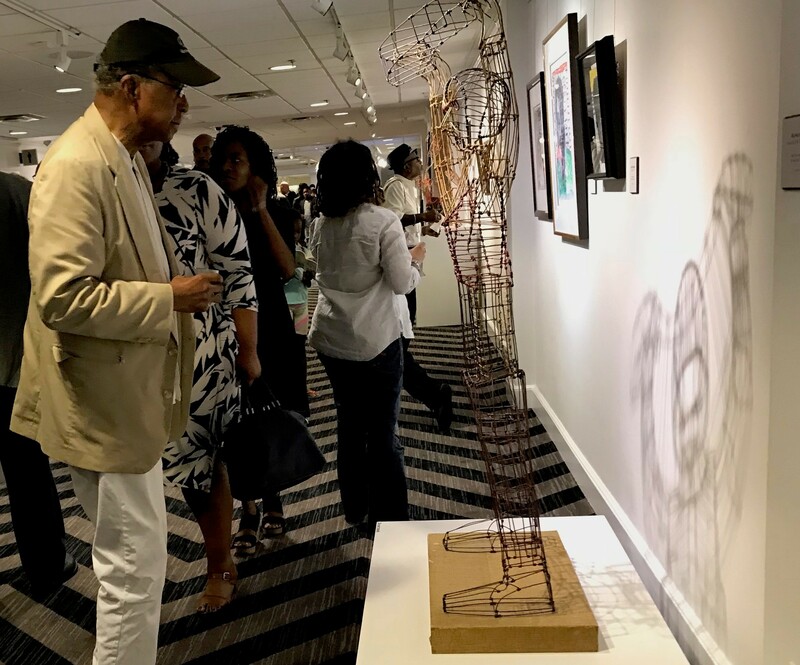 Although both artists were sculptors, painters, and printers, Key wanted to show work that hadn’t been exhibited extensively before, so the exhibit came to include Oubré’s wire sculptures and Coleman’s paintings. “We wanted to show a wide breadth by both artists,” Key said. Several speakers, including collectors of Oubré’s works, talked about how proud Oubré was of the strength of his wire sculptures. He would knock them over to demonstrate their durability to visitors, and Oubré was famous for his powerful handshake, which, the audience learned, once brought a 250-pound football lineman to his knees. 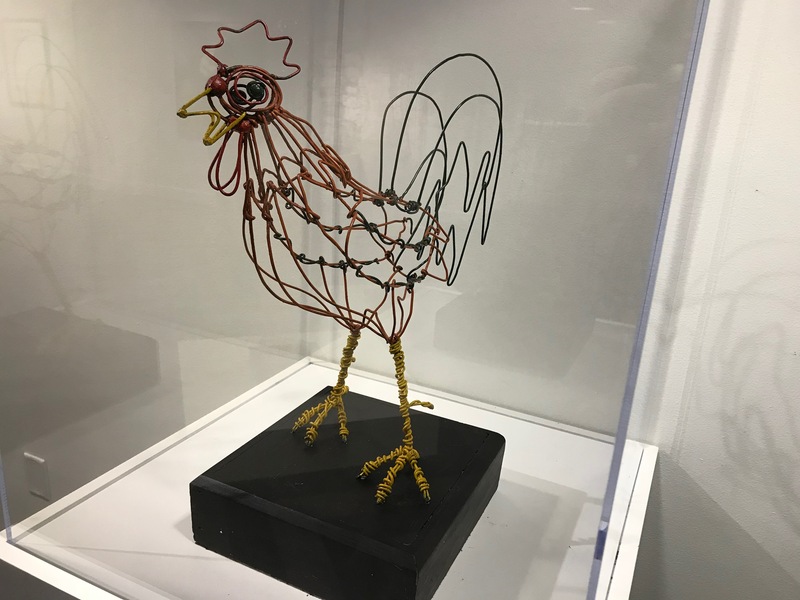 One wire work in the exhibit is “Proud Rooster” (1956), which represents a standing chicken upon a wooden base. Oubré colored the metal wire of the feet and beak yellow, of the tail and crown black, and of the bulk of the body red. The work, loaned from the collection of Larry and Brenda Thompson, is at once a marvel of technique and a playful use of the coat hanger “found object.” Oubré would offer his students a nickel for each bundle of coat hangers, Green said. Speakers agreed that Oubré could be tough to get along with and often got in his own way, but he lived through very difficult times, particularly for a black man who also wanted to make it as an artist. According to the Smithsonian National Portrait Gallery’s website, Oubré—who said: “I fought racism with my art”—could have “passed” for being white but proudly refused to do so. “When a student in his printmaking class at the University of Iowa made a racist remark, Oubré responded with a print of a black man attacking a snake representing the white race,” according to the National Portrait Gallery site. The racism that Oubré experienced is something Coleman could relate to as well. ‘We were under strict apartheid conditions,” he said of growing up in Alabama. He noted that black kids studied at institutions called training schools because “black folks could be trained but not educated.” The Klan marched every weekend, and black people couldn’t make eye contact with white people walking down the street. At Alabama State, Oubré ran a tight ship. He would get to class a minute or two before it was called to start, and he’d refer to students formally—“Ms. Jones,” “Mr. William,” “Mr. Coleman”— during roll call, Coleman said. In so doing, Oubré made it clear that he considered the art department to be a serious place. Coleman talked about the influence jazz musicians John Coltrane, Miles Davis and Thelonious Monk had on him, and several jazz-inspired works appear in the exhibit. Green, a musician, said his father-in-law initially took little interest in him. In fact, he said, the first time he visited his wife’s home one Christmas before they were married, Oubré remained glued to the football game on television. But, that changed when Oubré learned that Green was serious about his art, that his music was not only aesthetic but also politically active. And the two talked. “For every five minutes I had, he had 50” in the conversation, Green said. Oubré would listen to music while he worked, and he could play a single Dinah Washington song on repeat while making a single work, according to Green. “When the work was done, he’d listen to another song,” Green said. Coleman agreed that Oubré valued art that was also politically active, but he added that his teacher insisted the aesthetic bar be set high. “The aesthetic must be there or else it’s propaganda,” he recalled Oubré would say. Some of Coleman’s work is deeply personal, like “Boy on a Toy Horse” (1962), which appears in the show. The boy, who rides on the horse and whom Coleman rendered with a very-blue palette that evokes the works of Chagall, is based on a sketch he made of his son Tony. “It’s based on him, but it’s not a portrait of him,” he said.